DEER PARK, Ohio -- Luke Kuechly always enjoyed playing football at Deer Park High School as a youngster. 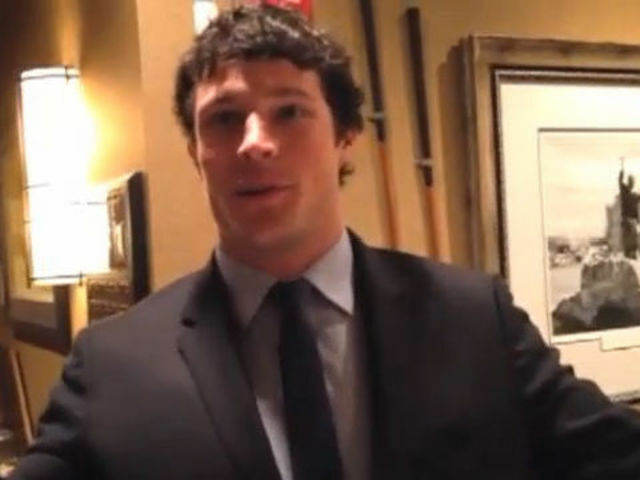 Kuechly, 24, returned to the Cincinnati area Thursday night as the featured speaker for the Deer Park High School Wildcat Boosters event at Montgomery Inn. Kuechly, a 2009 St. Xavier graduate who grew up in Evendale, appeared two months after he played in Super Bowl 50. The money raised from the event will be used for the field turf campaign for the Deer Park football field. Kuechly’s mother, Eileen (Burke) Kuechly is a 1978 Deer Park graduate. She asked her son if he would be willing to help with the fundraising campaign. Other members of the Kuechly family attended Deer Park, too. Kuechly enjoys staying in touch with family and friends in Cincinnati. He flew up from Charlotte Thursday afternoon and was scheduled to return to North Carolina late Thursday night. Friends from around Cincinnati still speak highly of Kuechly. Kevin Harris was his Catholic Youth Organization football coach. The home games were played at Deer Park. Harris never forgot the first conversation he had with Luke’s father, Tom Kuechly. Tom Kuechly gave the CYO football coach a scouting report of sorts on his fourth-grade son, Luke. To be quite frank, Luke was overzealous in the other sports he played. Luke played third base and often went into the outfield for fly balls. He didn’t always guard the opposing player in basketball. He guarded whoever had the basketball. But, Luke Kuechly’s aggressive play on the football field as a linebacker and fullback was an asset to the undefeated Golden Bears team that Harris coached to a city championship in 2000. Kuechly wore No. 40 – the same number he wore as an All-American at Boston College. “He was the kind of athlete who is going to pick up something and he is going to be pretty good at it,” said his Golden Bears teammate John Lloyd, who later played at CHCA and UC. Lloyd was a year behind Kuechly but they grew up in the same Evendale neighborhood. Kuechly and Lloyd hung out at the recreation center. They were on the Evendale Eagles swim team together. Luke Kuechly didn’t want to leave the field in grade school – even if the team was up by 14 or 21 points at halftime. The third- and fourth-grade team played its home games at Deer Park High School. Kuechly played home games at Deer Park until the seventh grade, Harris said. Several years later, Harris included a Golden Bears team photo in his letter to Kuechly for his senior day with the St. Xavier football program. The family most certainly has the photo somewhere. Steve Pike coached Kuechly in the fifth and sixth grade in the Golden Bears organization. In hindsight, Pike jokes he would’ve given the ball more to his fullback on offense. On defense, Kuechly stood out. Not a lot has changed in Luke Kuechly’s football demeanor as a three-time Pro Bowl selection and 2013 NFL Defensive Player of the Year for the Carolina Panthers. Harris, 57, wasn’t able to attend the event but he spent time with Luke and his family in early January in Charlotte. The Sycamore Township resident had lunch with the Kuechly family and drove around Charlotte during his visit.